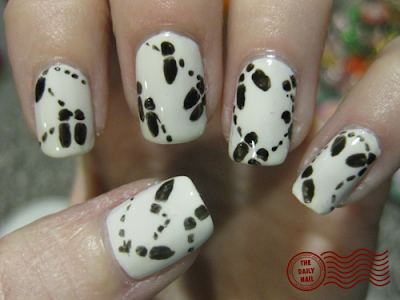 I used American Apparel Cotton as a base, with China Glaze Liquid Leather for the dance steps and directions. Topped it all off with 2 coats of Seche Vite top coat. SUPER cute!! I try to sometimes look at your title and come up with what design you did without looking at the picture - and I totally didn't guess this one. very creative! Those are darling! I'm loving it... great job, babe! It's ADORABLE!! I love it! These are too cute! You constantly amaze! Love your "stories" about the creative process, too. where do you come up with this stuff? soooo cute! How very Arthur Murray! Super cute! What do you call the step that's delineated on your digits? this is one darn impressive project! keep up the good work. I thought i'd give you a heads up about the AA nail polishes. apparently they've been pulled off the shelves. If they really are considered hazardous materials, you should stop using them for your own safety. Woops, just noticed that Lesley posted the same link. Oh well! It doesn't hurt to hear it twice. Hey! So I've been following your blog for a couple months now and was going back through looking at your different designs tonight because I'm trying to get some inspiration. I have no ideas tonight but I really want to do something besides one color. Anyways, this reminded me of the Marauders Map in Harry Potter.